This week the team polished our game and prepared for soft opening on Wednesday. Soft opening at EA went extremely well, and we have spent the rest of the week continuing to polish and playtest. The ETC Silicon Valley campus held our Soft Opening within the Atrium of Electronic Arts at Redwood Shores, California. 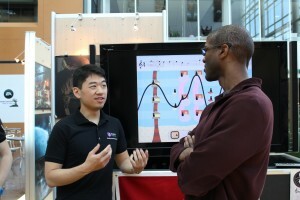 We demoed our product and answered questions to interested EA employees. We got a lot of valuable results: Our current level selection system which uses scrolling is difficult to use and we are considering switching to a traditional tile-based level select. 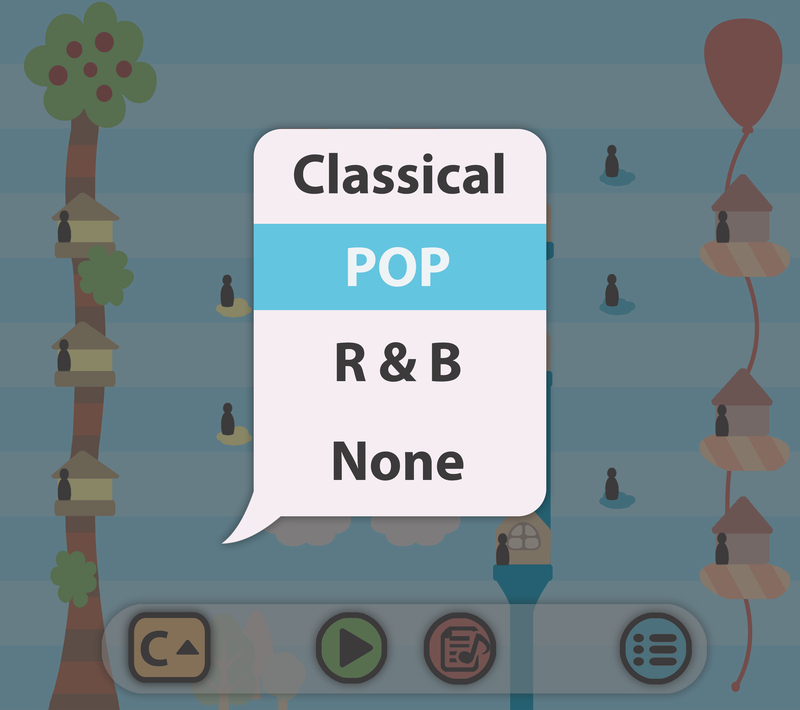 The current method of removing notes from the melody by tapping above or below is also not consistently intuitive. Finally, we found that most of our UI is intuitive, even if one skips the tutorial, all that is, except for the accompaniment style. In addition, in the afternoon, a group of Girl Scouts who were touring EA also stopped by to visit the project teams. The 11 girls and 1 boy were all within our target demographic of 8 to 12. 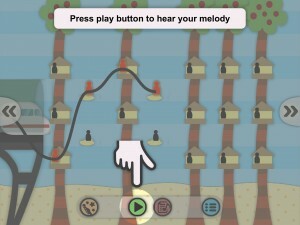 Using two finger scroll to navigate the levels is a stumbling point, even sometimes with the tutorial. We will most likely implement actual UI for level-scrolling. Polish was the big theme of this week, from polishing in preparation for soft opening to polishing in response to feedback from soft opening. Going in to softs, our programmers did an amazing job cleaning bugs and memory leaks. While previous builds of the game would occasionally crash if one tried the exact wrong combination of actions, our build for softs was robust enough that we did not experience a single crash the day of. Next week is the last week before finals. We will be putting the final touches on our game, and implementing our other levels as well as the latest tutorial, which will reflect changes made to our final UI. In addition, we will have two more individual playtests next week to confirm changes that we have made since softs. Last week was Spring Break for all of CMU but that didn’t stop Bravura from working: we had a playtest with young boys in our demographic and the results were promising. This week, Bravura prepared for and gave our half-semester presentation / demo where we received even more useful feedback. On Tuesday, March 12, Bravura had the chance to playtest our app with 18 boys from Markham Elementary School. Some of them had experience playing instruments, but fewer had tried to create music. Overall, the kids had little trouble interacting with the experience, and most of their feedback was about wanting more features. They wanted to play more and longer levels and especially wanted the ability to share their creations. Some even asked when the app would come out so that they could buy it! The team is really encouraged because not only was this our first playtest with kids in our demographic, but it also confirmed many of the design choices and changes we’ve made to our prototype so far. Halves presentations were on Friday this week, having been pushed back from Wednesday because of conflicts with EA. However, that just meant that the team had more time to prepare and we were well-rehearsed and confident by Friday. 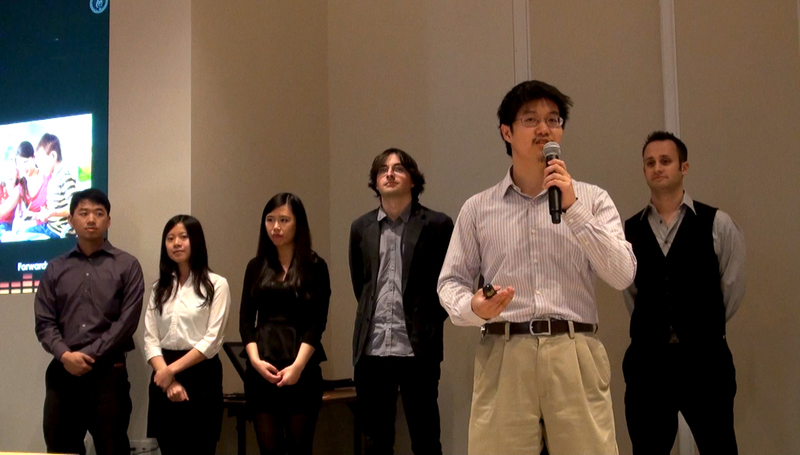 The presentation went smoothly, and the team got thoughtful questions about our work so far and our plans. One guest who had been at Quarters asked, “how are [music] guidelines currently implemented? ” and the team had an opportunity to talk about how we have utilized buildings and positive reinforcement to create a visual style to reflect musical structure without being overbearing. Even more valuable, though, was the project demo that Bravura gave after the presentation. Guests had a chance to play with our prototype first-hand. 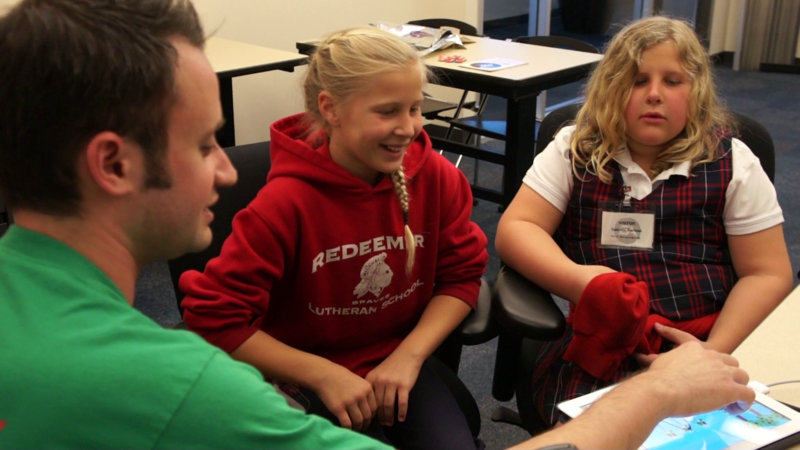 The hands-on interaction allowed guests to give us more specific and targeted feedback. Their sentiments confirmed features we knew we needed such as feedback during playback, but they also had some interesting suggestions. In particular, both Roger and Govind mentioned that it might also be nice for there to be a level that starts with a familiar pre-existing song. The whole team will be attending GDC next week and so the project will be on hiatus then. However, we intend to get right back to work starting the week afterwards. The team has already met post-halves and looked at the work that still needs to be done. We’ve prioritized the remaining features, and now that we’re wrapping up the line-drawing, sequencer, and voice systems that were pre-halves priorities, we plan to begin work in earnest on systems like level-creation, accompaniment-generation, and sheet music conversion. Idan from IncidentTech trying out our app. Team Bravura had a very exciting week; we got to conduct our first playtest on Monday and on Wednesday we met with Incident Technologies for information about what they’re doing and feedback on our application. We’ve been busy integrating all of this feedback into our current application build. We had a blast showing our progress so far to our fellow ETC-SV students. 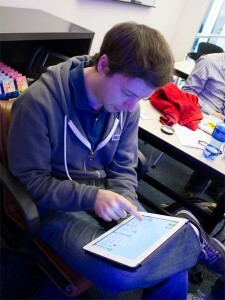 The test consisted of a preliminary build of the application on an iPad and a “paper-prototype” where Nate simulated a more full experience. Above all, people really enjoyed the application! With no prior musical experience, they DID feel like they were composing music. The playtest provided useful feedback about features we are considering integrating into the application. We learned that people were in fact interested in looking at how their melody can become music notation, that they wanted to continue to explore a level even after creating a melody, and even if they were not fond of their melody at first, when they added accompaniment, they were unanimously impressed. They enjoyed trying different accompaniments, with the added educational bonus of learning about the differences in musical style that we didn’t even anticipate. In sum, the playtest was extremely successful and rewarding; it was encouraging to find we’ve been moving in the right direction towards our goal of allowing everyone to create music. A visit from the creators of the gTar, Idan Beck and Josh Stansfield of IncidentTech, to ETC-SV proved to be just as encouraging. Their product is a digital guitar designed so that anyone can pick it up and start playing. 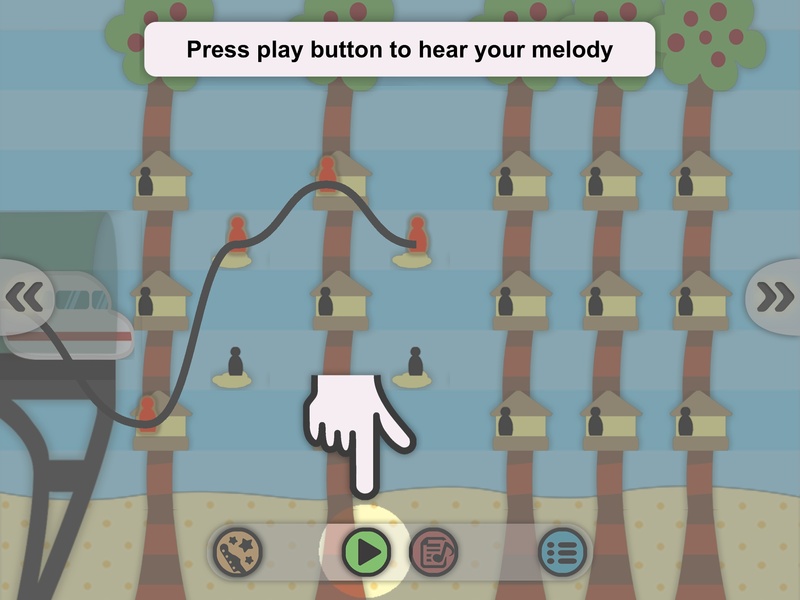 After docking an iPhone into the gTar, you can pick your song and difficulty level, and the notes you need to play light up on the frets of the instrument. The goal of the gTar is very similar to ours; to show people that anyone can create music. After their demonstration, we showed them our current version of our application. As they have experience designing a music product for non-musicians, they had a lot of valuable feedback. They really liked our application, notably the overall design and art style. Idan pointed out that our way of visualizing music is perhaps even more effective than traditional sheet music! He also gave us interesting feedback on voice as input and the art specifics. Next Tuesday, Nate, Cheng, and our advisor, Jiyoung, are going to conduct another playtest with students visiting Electronic Arts from Markham Elementary school. We will also be spending the next week and a half preparing for our halves presentation and demonstration. As we make small refinements to the application from our testing results, Mike will compile these changes into a build to show at halves.